Introducing the Firgelli Linear Actuator. What is the Firgelli linear actuator used for? What do the Firgelli linear actuators look like? How is the Firgelli linear actuator connected to an NXT Robot? 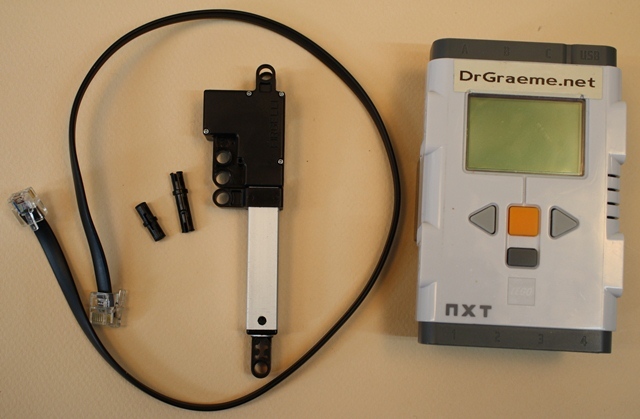 How can we test the Firgelli linear actuator using NXT-G? How can we test the Firgelli linear actuator using RobotC? How can I get my hands on a Firgelli linear actuator? 1. What is the Firgelli linear actuator used for? The Firgelli linear actuator facilitates the use of straight-line movement in the construction of LEGO NXT models. This provides an additional type of movement to add to the more usual rotary movements provided by the motors supplied with the LEGO NXT kits. The LEGO actuator needs an external motor to drive it, whereas the Firgelli actuators have in-built motors. 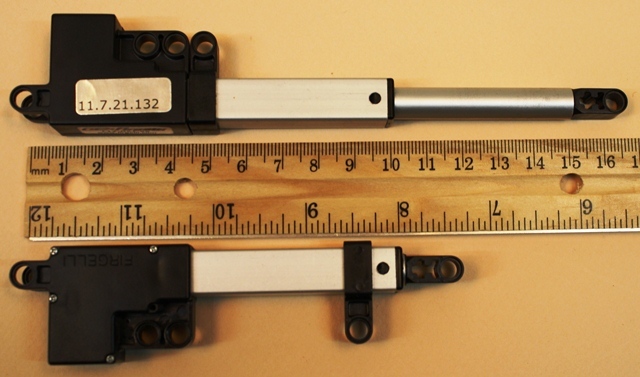 The LEGO actuator has a linear movement of approximately 4 centimetres (about 1 1/2 inches), the shorter Firgelli actuator has a linear movement of approximately 5 centimetres (about 2 inches) and the longer Firgelli actuator has a linear movement of approximately 10 centimetres (about 4 inches). The internal motor speeds of the Firgelli linear actuators can be varied under program control. The LEGO linear actuators can provide the same facility via a variable-speed external motor. The LEGO linear actuator can be driven by a hand-operated wheel. The Firgelli actuators can only be driven by program control of the internal motor. 2. What do the Firgelli linear actuators look like? Two shorter Firgelli linear actuators are shown below, with the linear extension both fully extended and fully retracted. Two longer Firgelli linear actuator are shown below, with the linear extension both fully extended and fully retracted. The distances marked on the ruler are centimetres and inches. YouTube, a wmv movie and an mp4 movie with similar information can be seen below (19 seconds); note that some videos can be expanded to a full screen by clicking on or in the lower right-hand corner of the movie screens. 3. How is the Firgelli Linear Actuator connected to an NXT Robot? We can connect the Firgelli linear actuator to a LEGO NXT MindStorms robot using standard connectors and a standard motor cable, as shown in the videos (1 minute 15 seconds) below; note that the videos can expanded to a full screen by clicking on or in the lower right-hand corner of the movie screens. In the movies above, a connection to an NXT robot is only shown for the shorter of the two Firgelli actuators. This is because the method of connection to an NXT robot is identical for both sizes of Firgelli actuator. 4. How can we test the Firgelli Linear Actuator using NXT-G? NXT-G is the method of programming supplied with your retail LEGO NXT MindStorms 2.0 set. You do not have to purchase anything extra to use NXT-G.
"Firmware" is the "software operating system" that goes inside your LEGO Computer Brick to enable it to function. Your computer brick comes with a version of firmware pre-installed. Periodically, maybe once or twice a year, LEGO releases improved versions of firmware for your LEGO computer brick. It is probably worth checking before the start of each school term, if the version you are using is the current one. The process for checking, and how to update the firmware, is covered by DrGraeme videos available here. 4.2 Downloading and installing the Firgelli Linear Actuator Block for NXT-G.
Next we have to get a "Firgelli block" to enable our LEGO NXT-G system to recognise the Firgelli linear actuator. We can download the Firgelli block from here. Let us start up the NXT system, and program the actuator to go out 90 millimetres at 100% speed, back 80 millimetres at 75% speed, out 80 millimetres at 50% speed, and back 80 millimetres at 35% speed. Why 35%? I had originally set the power to be 25%, but the internal friction inside my Firgelli actuator was such that it would not move at any power under 35%. When I initially tested it at 25% power, it just sat there, completely unmoved by my program. The following videos demonstrate how to achieve this. The program from 4.3 has been downloaded into the LEGO NXT robot. We will now run the program to see what the Firgelli linear actuator looks like working. Note that the videos can expanded to a full screen by clicking on or in the lower right-hand corner of the movie screens. 5. How can we test the Firgelli linear actuator using RobotC? The Firgelli Linear Actuator will not work with RobotC 2.0. However we hear it will work with RobotC 3.0, so hopefully this section will be completed a little time after RobotC 3.0 becomes available. 6. How can I get my hands on a Firgelli linear actuator? I did not purchase the actuators I own from Firgelli - they were purchased from another on-line store which has an excellent reputation. However I could not get them to work. To their credit, Firgelli suggested some tests, and when these tests did not work, they requested that I send them direct to Firgelli in Canada. I did so, and the error was found to be a manufacturing fault. Firgelli promptly replaced them at no additional cost to me. On this basis, they seem to be a firm that is interested in both their products and their customers, so I'd recommend purchase direct from Firgelli, click here - (to get to the "add to cart" button, you have to click on the title of the actuator or cable displayed).